Raju and Avishag have been running Hotel Minerwa for 4 years and have grown the Hotel/Restaurant from a small guesthouse with five rooms to its current size of 20 rooms. The Minerwa has been a family business operating for 15 years. They are proud to say that they have continued to uphold the reputation of a clean, friendly Havelli style guest house with traditional Indian decor and great service staff. The Minerwa Hotel as an experience is summed up best in the Indian saying Sab Kuch Milega, its Hindi meaning, 'Everything is Possible"! The top two floors have breathtaking views, cool marbled floors, encouraging you to lounge around relaxing on comfy cushioned upholstery, Raj style. With TV and DVD guests are welcome to select from a vast range of DVDs in English and Hebrew. In addition there is free Wifi internet connection as well as an internet cafe on the ground floor. 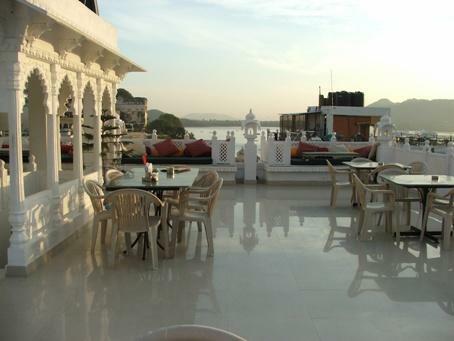 The rooftop restaurant has traditional decor, beautiful Jharokha, (the Hindi word for the cushioned ornate window seats of the region) and serves a tasty range of food from all over the world including Israeli, Chinese, and Korean, Italian and Western cuisine as well as traditional Indian cooking. Complimentary Newspapers in Lobby, Safe Deposit Box-Front Desk, Room Service, Restaurant, Security Guard, Welcome Drinks, Family/Child Friendly, Doctor on Call, Catering, Doorman. Complimentary Newspaper, Basic Bathroom Amenities, Desk, Smoking Rooms, Room Heater, House Keeping, Cable/Satellite TV, Television Room, Ceiling Fan, Dustbins. User reviews for "Grand Minerwa Hotel Udaipur"